Sir Alfred & Lady Beit, heirs to a fortune made in diamond mining, purchased Russborough house and it’s parklands in 1952. In these new owners Russborough was fortunate to find custodians with both the means and passion to maintain It. Over the course of two decades the Beits added their unrivalled collection of Old Masters paintings, furnishings and decorative arts to the house. The advancement of education in the fine arts and to enrich the cultural life of the nation by promoting art, craft and music. The house Opened to the public in 1978 so that visitors from all over the world could experience firsthand the grandeur of Ireland’s architectural heritage and the Beit’s art collection. Russborough now plays host to more than 100,000 Visitors each year. This Easter Russborough launched a new tree trail. 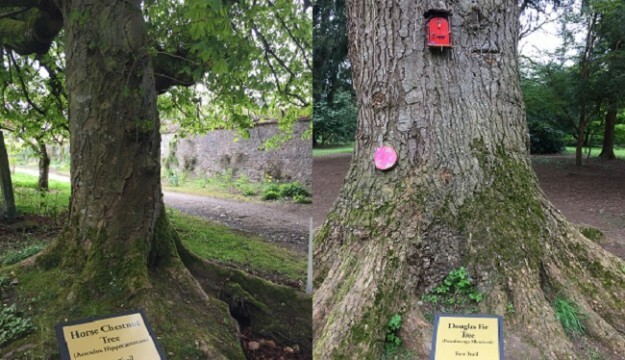 The trail is suitable for Families & schools and is a walking tour taking in 10 wonderful trees within the Russborough Demesne. Some of the trees mentioned are ancient beech, horse chestnut, Douglas fir, common Oak, Wellingtonia & Yew. One of the trees was planted in 1861 by the then Prince of Wales & Earl of Dublin Who later became King Edward V11. But watch out some of the trees have been inhabited by fairies so be quiet as you walk along the pathway.